I was in the neighborhood so I went to Porchetta, maker of stupendous porchetta (roasted pork loin wrapped in pork belly), for a sandwich. I planned to get their wonderful porchetta sandwich, but, seeing a sign for banh mi, decided to go for it as part of my quest for a great banh mi. While the porchetta was divine -- moist pulled pork of two kinds with little crackling rewards -- the banh mi was not successful. First, the pork is seasoned with Italianish spices. Second, there were no other meats, like pâté and ham. Third, they added thinly slice red onions, which seemed only to reinforce the Westernness of the thing. Fourth, they added too much mayonnaise, although it was the real Kewpie that is used widely in the Far East. Fifth, the hot sauce was normal hot sauce, not sriratcha. And finally, there were no jalapeños or cucumbers. Also, the sandwich is a bit sloppy, as can be seen above, although this is less apparent when it is closed and ready to be eaten and ultimately a minor quibble. 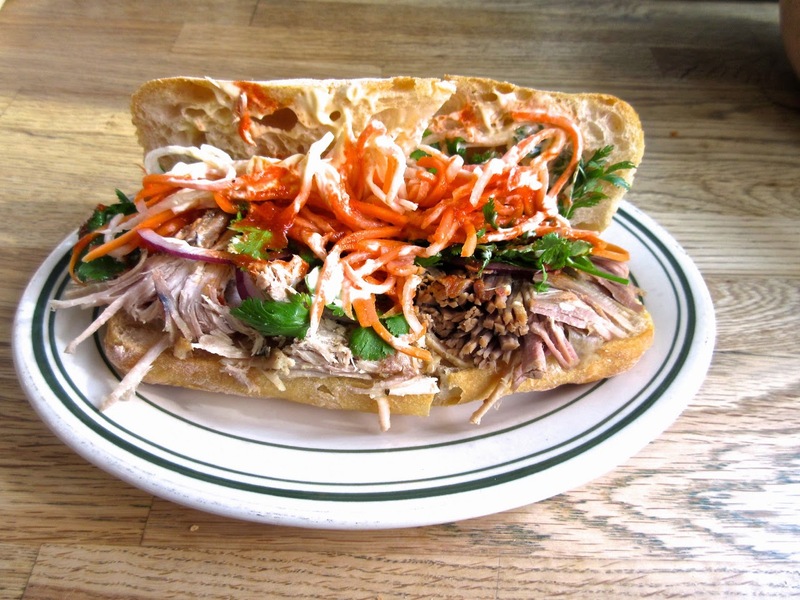 The bottom line: an excellent pork sandwich but missing the wonderful melange of Vietnamese tastes that is the essence of an authentic banh mi.